When's the right time to use thyme? All of the time! 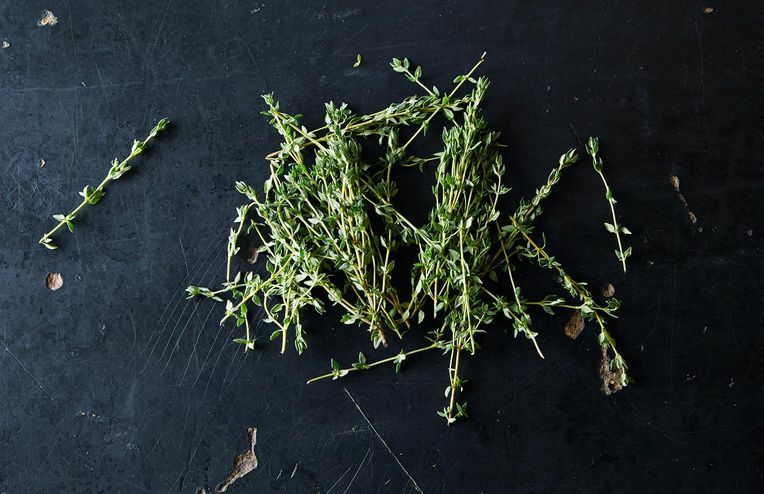 Use thyme's tiny leaves in every meal from sunup to sundown. Merrill shares a recipe for a kinder, gentler fish: tilapia poached in olive oil. A no-cook, company-worthy sauce that fits right into our laziest pasta-dressing habits. Congratulations to vvvanessa, whose White Peach and Lemon Thyme Galette won the contest for Your Best Fresh Herbs. Too Many Cooks: What's Your Favorite Herb? You'll be hearing from the staff at FOOD52 every week in Too Many Cooks, our group column in which we pool our answers to questions about food, cooking, life, and more. With temperatures cooling, the way we cook is changing: rather than just sprinkling some sea salt on a fresh heirloom tomato, it's the season for caramelized onions, roasted vegetables, soup, and...lots of herbs. This week, we tackle the question: What's your favorite herb? Our answers are pretty divisive -- everyone has their favorite. Here they are, in order of popularity. Did we miss your favorite herb -- tarragon, parsley, marjoram, or anything else? Let us know in the comments! This week, Cindy Pawlcyn shows us how to make red wine vinegar at home.